Your yoga practice is a powerful tool to help you cultivate balance. Everyday is different. You can roll out your mat and decide which practices you’ll emphasize and which you’ll minimize to balance your energy. Years ago I was sitting in my 500-hour training at Yoga Center Minneapolis and my dear friend Betsy Weiner was leading us through a course about the energetics of sequencing. At this time I had completed my certification with The Baptiste Institute and was practicing and teaching Baptiste Power Yoga. I remember listening to Betsy and realizing how intelligent Journey Into Power (the Baptiste Yoga sequence) really is. I remember thinking that day how I wanted to develop workshops to help my students understand how powerful this sequence is and how they can shift it as needed to balance themselves. This was the inspiration behind our Level Up Series of Workshops. Within Ayurveda, yoga asana and pranayama are divided into two energetic principles: brahmana and langhana. From Sandskrit, brahmana means “expansion,” while langhana means “reduction.” Are you feeling tired and sluggish? Applying Brahmana during practice helps strengthen the nervous system, boost energy, promote vitality and support metabolism. Alternatively, are you feeling flustered, clenched, high strung or over caffeinated? You could consider bringing in more soothing forward folds and twists into your practice. Move slowly from posture to posture and hold them longer than usual. Your breath and mantras are also important tools in balancing your energy. Inhales will energize while exhales can calm. There is room to play with the length and holds of your breath along with specific types of pranayama practices. A common soothing pranayama is alternate nostril breathing or Nadi shodhana while Kapalabhati breathing helps increase circulation and clear the mind. Choose a mantra that fits with the energy you’re seeking to shift. For example, if you’re practicing brahmana select a mantra like “light” or “expand” and if you’re practicing more langhana choose “calm” or “soothe”. These tools to balance are always available. Journey Into Power is an extremely intelligent sequence and is designed with plenty of moments to increase brahmana or langhana. 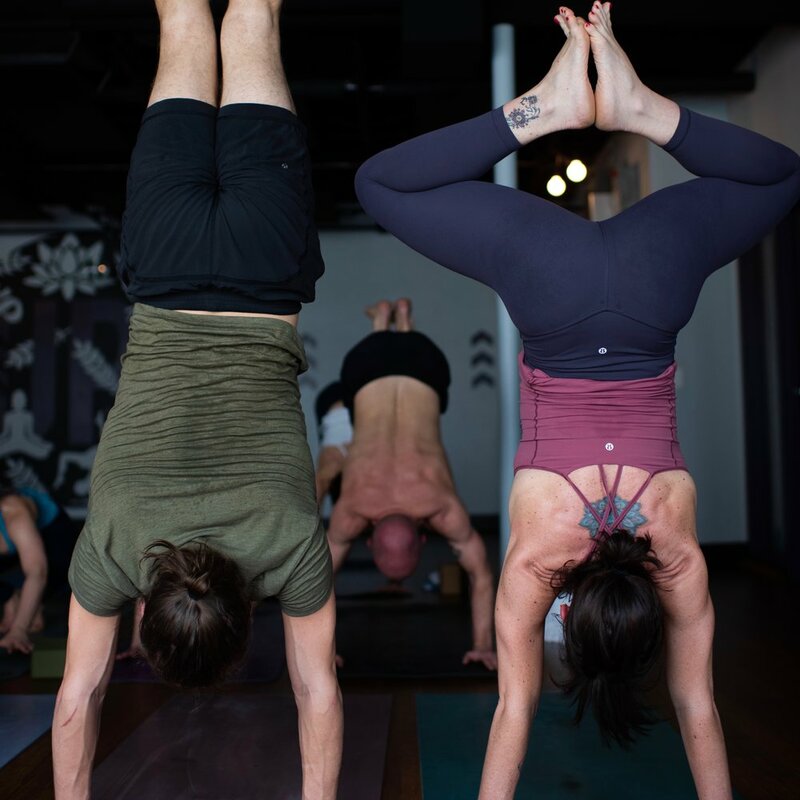 You can walk into a class at Up Yoga and know you’ll have the opportunities to increase or decrease the energy needed. The sequence awakens and inspires, twists, folds, turns you upside down and allows time to open and release. Thank you Baron!!! Hold postures in Vitality to build heat, option to add in small back bends. Hold postures in Vitality to build heat with focus on sukha, the ease to the fire. Tune in to how you feel before class. Consider what you need to achieve more balance knowing cultivating balance isn’t as easy as it sounds. You need both wisdom and clarity. Consider it’s like the volume on your car radio. When you are clear on your energy and purpose you can turn up or down the volume throughout your class to move into balance.